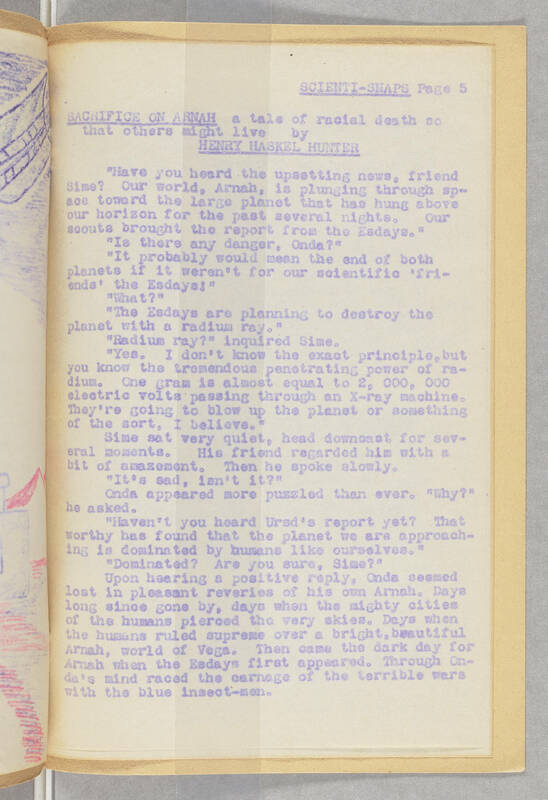 SCIENTI-SNAPS[Underlined] Page 5 SACRIFICE ON ARNAH[Underlined] a tale of racial death so that others might live by HENRY HASKEL HUNTER[Underlined] "Have you heard the upsetting news, friend Sime? Our world, Arnah, is plunging through space toward the large planet that has hung above our horizon for the past several nights. Our scouts brought the report from the [Eadays?].' "Is there any danger, Onda?' "It probably would mean the end of both planets if it weren't for our scientific 'friends' the Esdays!" "What" "The Esdays are planning to destroy the planet with a radium ray." "Radium ray?" Inquired Sime. "Yes. I don't know the exact principle, but you know the tremendous penetrating power of radium. One gram is almost enough equal to 2, 000, 000 electric volts passing through an X-ray machine. They're going to blow up the planet or something of the sort, I believe." Sime sat very quiet, head downcast for several moments. His friend regarded him with a bit of amazement. Then he spoke slowly. "It's sad isnt it?" Onda appeared more puzzled than ever. "Why?" he asked. "Haven't you heard Ursd's report yet? That worthy has found that the planet we are approaching is dominated by humans like ourselves." "Dominated? Are you sure, Sime?" Upon hearing a positive reply, Onda seemed lost in pleasant reveries of his own Arnah. Days long since gone by, days when the mighty cities of the humans pierced the very skies. Days when the humans ruled supreme over a bright, beautiful Arnah, world of Vega. Then came the dark day for Arnah when the Esdays first appeared. Through Onda's mind raced the carnage of the terrible wars with the blue insect-men.